READ THIS BOOK, FOLLOW THE INSTRUCTIONS AND STOP DRINKING NOW. Allen Carr's Easyway is the most successful stop-smoking method of all time. It has helped millions of smokers from all over the world to quit. Now it has been applied to problem drinking. After explaining why you feel the need to drink, he shows you how to escape from the alcohol trap. 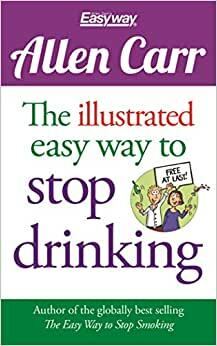 With the brilliant illustrations of Bev Aisbett, Allen Carr's globally best-selling method is presented here in a truly refreshing, accessible, dynamic, funny and enjoyable way. Allen Carr has helped millions worldwide and he can do the same for you. His books have sold over 15 million copies worldwide, and read by an estimated 40 million people, while countless more have been helped to quit through his network of clinics. Allen Carr's Easyway has spread all over the world for one reason alone: BECAUSE IT WORKS. Allen Carr was chain-smoking 100 cigarettes a day, despite the fact that his sister, Marion, and his father had died prematurely of lung cancer. After repeated failed attempts to stop smoking, Allen's conversion into a non-smoker was as dramatic as it was totally unexpected. His discovery of the kernel of what would become the Easyway method brought about another life-changing decision: to dedicate his life to the fight against nicotine addiction. Since 1983 Easyway has been built into an international brand with clinics across the world. This little book was recommended to me by a friend, for a family member struggling with alcoholism. The basic advice in this gem is to change the way the addict thinks about addiction and alcohol, such as DON'T think about the addiction as a lifelong struggle, but as an obstacle to a full, healthy life that CAN, in fact, be overcome. After speaking with my family member, rehab has a lot of focus on the lifelong struggle, which it IS, but that focus can create additional negativity to an already difficult struggle. My family member is interested in giving it a look. For me, as part of the support team, it gave me another way to view, and therefore advise, the addict when we talk. Is it really the easy way? For some people, the change in mindset is probably enough to turn them around. For others, the new way of viewing addiction can be a powerful, useful tool in their ongoing battle. 5.0 颗星，最多 5 颗星If you want to quit, this will help. I've purchased this for several friends and family. Nearly everyone has been successful.